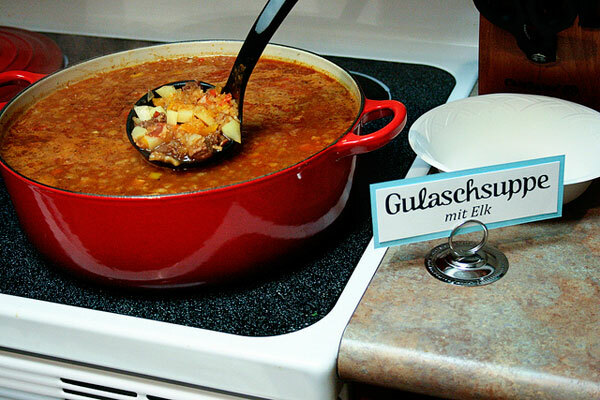 One of the most memorable dishes from our trip to Germany was a venison Gulaschsuppe (goulash soup) in the Bavarian town of Schwangau. Thanks to Stephen Cashman, we now have some venison in our freezer; however, it came a little too late for our Oktoberfest celebration. Instead, we found some elk meat at one of our favorite local country stores, Gearhart’s Meats. Goulash is a cuisine of Hungary. The German version is commonly a beef (or game) soup or stew with a savory tomato broth and, of course, lots of paprika. This was a big hit at the party, and would also make a delicious hearty soup on a cold winter night. In a large (at least 6.5 quart) Dutch oven, cook bacon over medium heat until crisp. Transfer with a slotted spoon to a large bowl. In the same pot, brown meat in small batches in bacon fat over high heat. Transfer it as it browns to a small bowl. Reduce heat to medium and add oil. Add onions and garlic and cook about 2 minutes. Stir in paprika, cayenne pepper, caraway seeds, and flour, and cook about 2 minutes. Whisk in vinegar and tomato paste, and cook about 1 minute. (Mixture will be very thick.) Stir in broth, water, salt, bell peppers, bacon, and meat, and bring to a boil. Simmer, covered, stirring occasionally, for 45 minutes. Add potatoes and simmer, covered, about 30 minutes until potatoes are tender. Season with salt and pepper.